Our no-fuss Grow Tub™ Herb and Transplant pots are designed to make seedlings healthy, strong, and transplant-ready! Our non-woven geotextile material will make sure your seedlings have an ideal air and water ratio to grow strong for transplanting into raised beds, containers, or straight into the garden. It's easy to clean and store our grow tubs, too, as they're machine washable and built to fold flat. 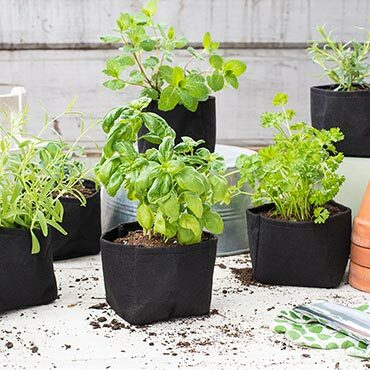 Use them for all types of seedlings, seed mats, grow balls, single-serve salads, herbs, and even to put around houseplants whose containers you'd like to keep clean! 4" x 4" x 4". Each package includes 6 transplant pots.